A LED Bar display for 10 Baht! How does a frequency to voltage converter work? Is your backlight pin in the wrong place? Following on from Chiptunes, this is an ArduinoBoy specific article. 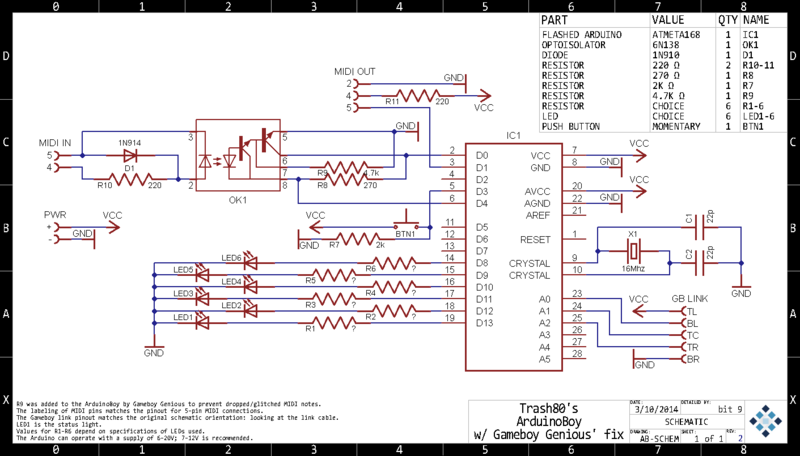 ArduinoBoy was developed by Trash80. It also covers ArduinoBoy derivatives, such as TeensyBoy, and others… This blog is continued in Making your own ArduinoBoy. 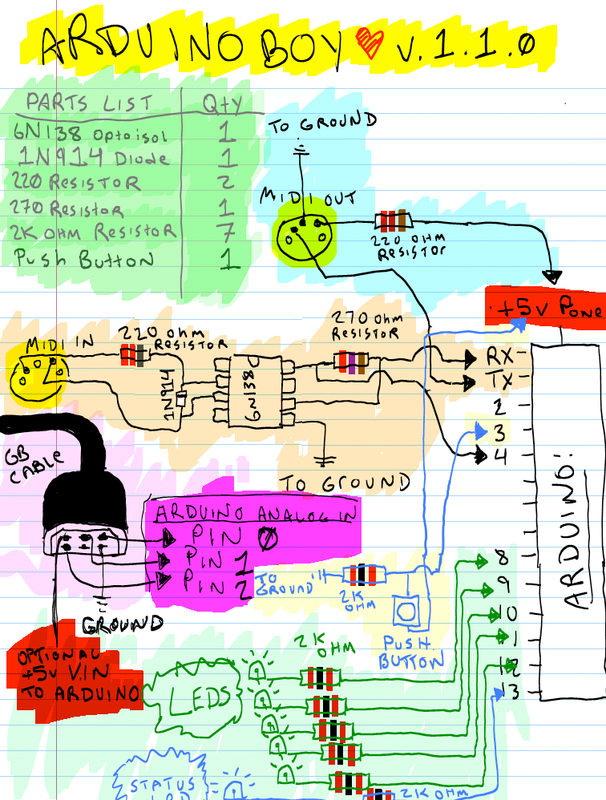 Instructables: Build an ArduinoBoy – a nice guide, but no PCB/board layouts provided. Also, rather confusing as it shows a SparkFun Arduino Protoshield v.2 at the top of the page, but then a barebones ATmega328P-PU is used instead. 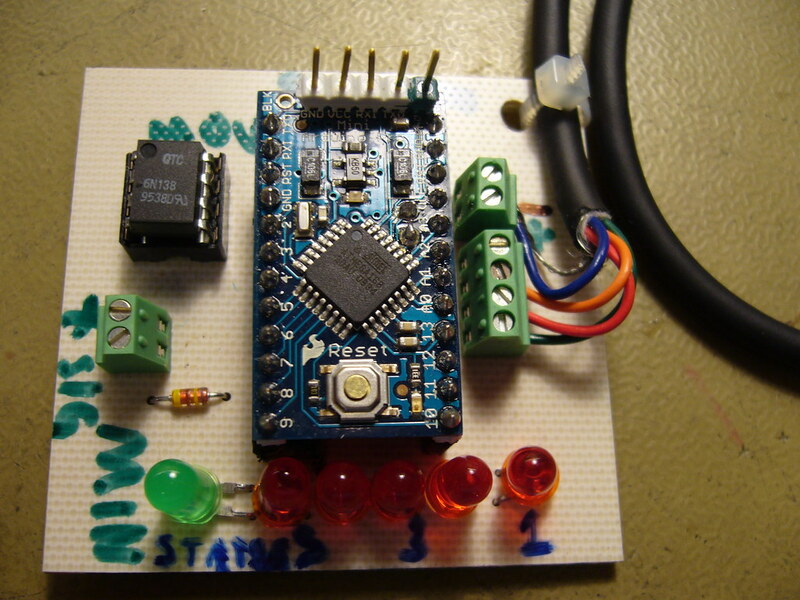 You don’t need to pay loads for a kit, and a pretty looking Arduino Uno shield. 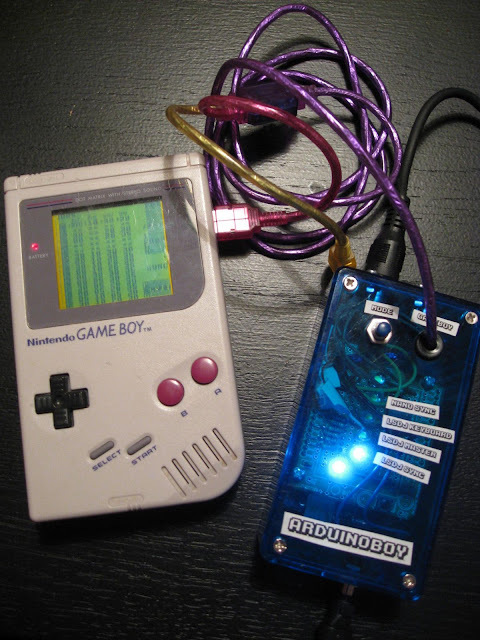 See x-post from Gameboy – Arduinoboy perfboard and shield schematics + mGB guide for making chiptunes with Gameboy and Midi!. 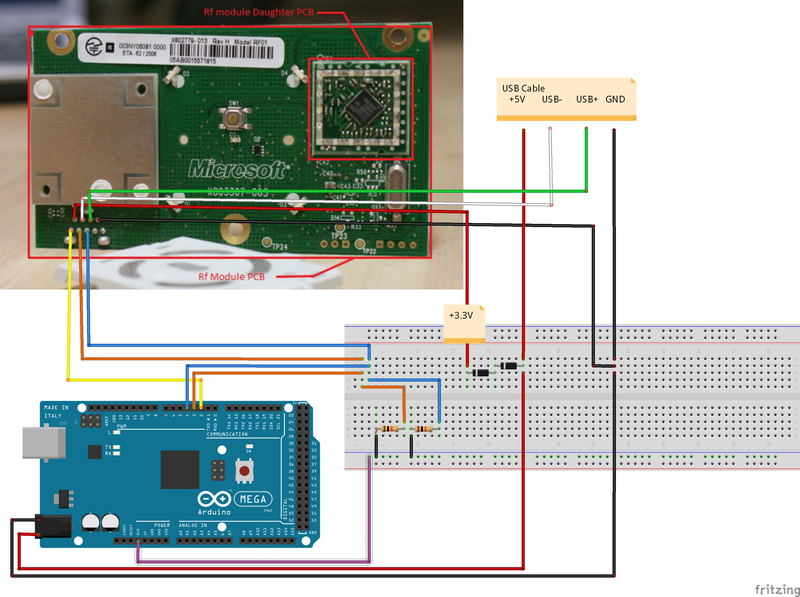 After thinking about this for a while, and considering the simplicity of the ArduinoBoy, I thought that it would be simple enough to dispense with the Arduino Uno, and just use an ATmega328 and build the whole thing on one board. A subsequent search showed that I was obviously not the first person to think about this. 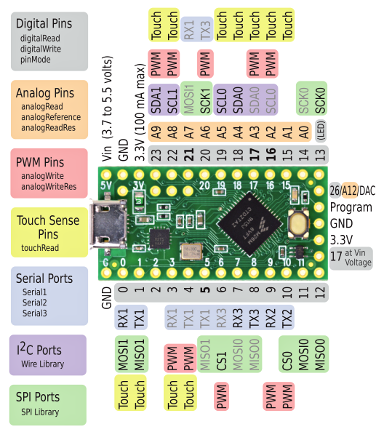 From Instructables – Build an ArduinoBoy, a simple guide, using a BareBones Arduino kit. See Barebones Arduino for more information on the Arduino side of the board. This article mentions the PushPin project that only works with GBC, however the link has died unfortunately. I’d imagine most everyone here would recognize this image. (In someone else’s words:) “It’s surprising how much good that crayon drawing has done for the chiptune world…” I hope I’m not stepping on anyone’s toes when I say it could be a little more readable. So that’s why I’ve added this. It has Gameboy Genius’ fix to prevent lost MIDI notes when running off GB power. An addition I wouldn’t mind being better known, because it took me some time to come across it. So, while I’m dumping technical documents like so much unwanted bologna, I’m hoping someone who Googles to this page learns about it faster than I did. 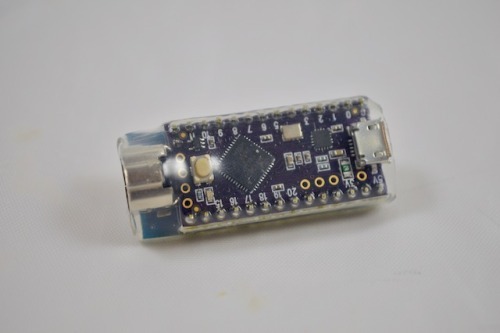 This is a fairly small, 1 sided Arduinoboy measuring in at 1.875 x 1.55 in. 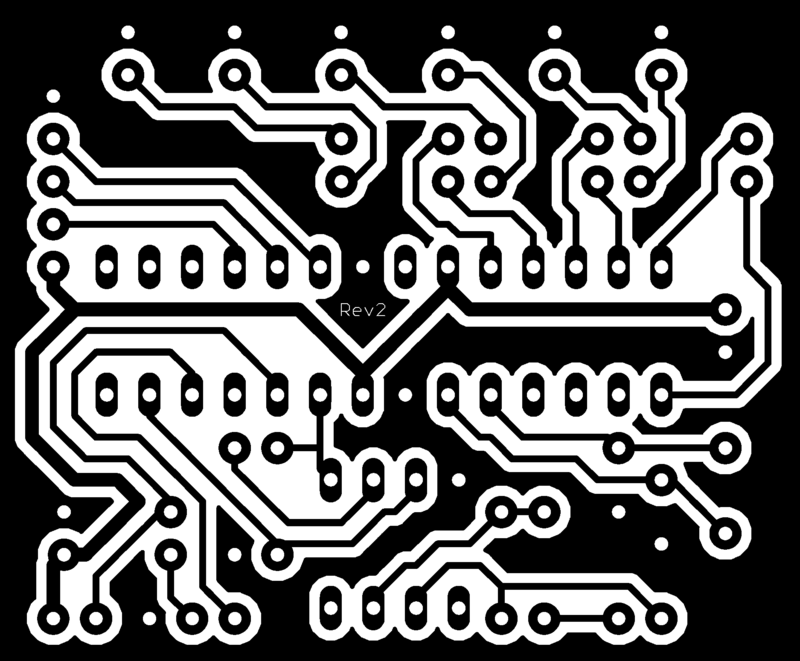 The thought I had in addition to making it a companion to the schematic above is that this is an easily etch-able circuit board. If you don’t know what I’m talking about check this out, but there are several other ways to do this. That’s why there’s this black and white version for you to print out. If you are going to etch this, make sure you flip it if your method requires it. This image is at 1000dpi, because I can, and a decent laser printer can do it. Eagle outputs aliased images, so high-res-ing the image is a way to get around any jaggy problems. I took the liberty to make the holes smaller so that when you drill you’ll have copper right at the edge. If you do use this, post it here and let me know how it went! Also, also: if you’ve googled to this and don’t know what this is – this is the answer you’re looking for. ArduinoBoy with Genius fix (not mirrored). 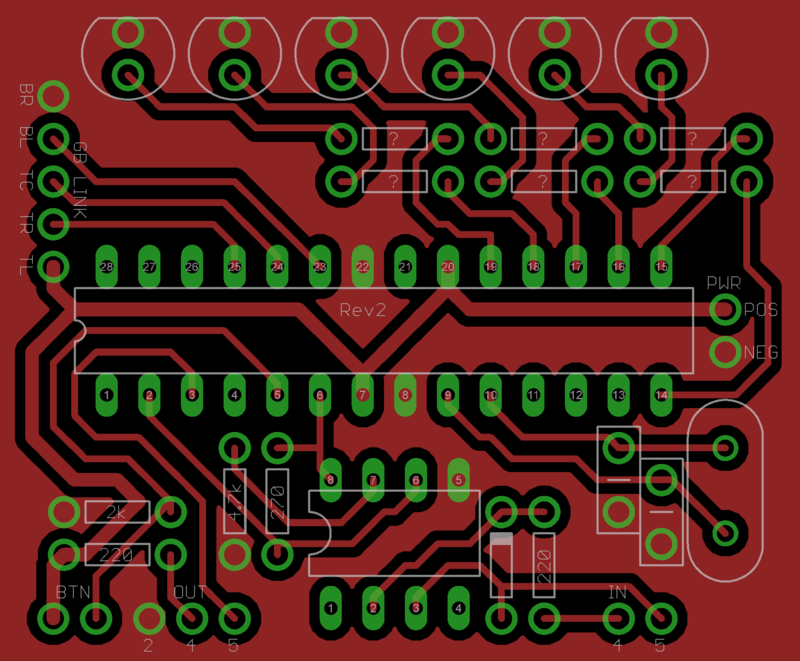 In order to get the image to scale and print at the correct size and orientation, see Scaling PDF for PCB for the full details for this particular example. Don’t ground the MIDI in! > a bit too tired and couldn’t find any information. 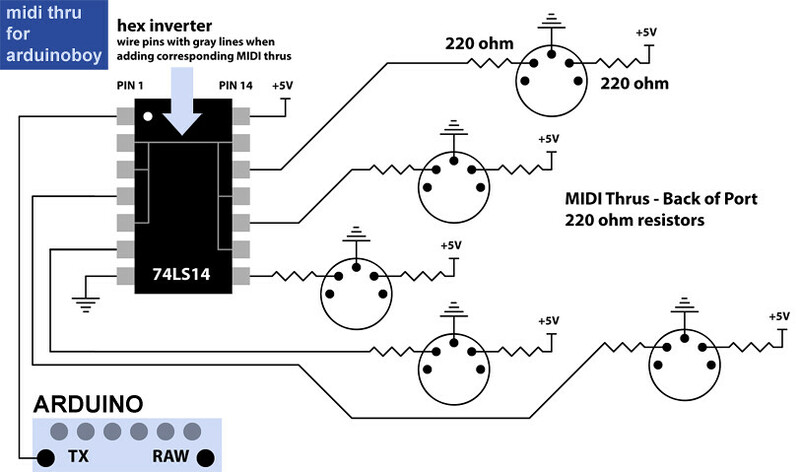 nullify the whole concept of opto-isolation that MIDI is based on. 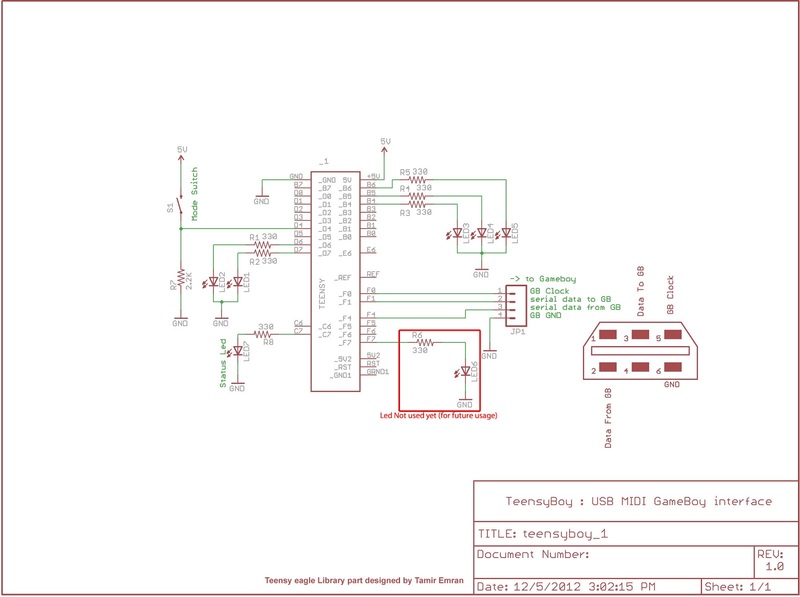 However, looking at the schematic, the GameLink connector doesn’t make much sense, at first glance, nor are the MIDI connectors DIN. 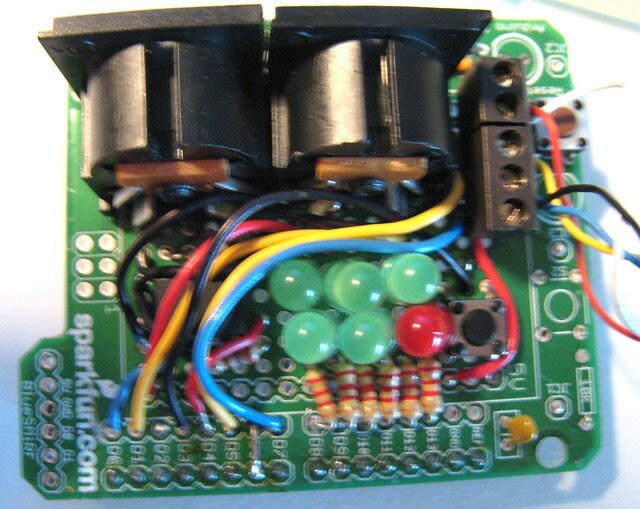 From a complete example of the various MIDI sockets, PCB mounted and panel mounted, see DIN sockets. Whilst PCB mounted DIN sockets are more convenient and can make for an easier and more compact build (inasmuch as there are less dangling leads to panel mounted sockets), care should be taken with PCB mounted MIDI DIN sockets, as the constant plugging and unplugging of MIDI cables can and will place undue stress on the PCB. Having panel mounted sockets avoids this problem. Last, the MIDI ports themselves are a cheap, bendy plastic. Mine haven’t died on me yet, but I’m just counting the days. Sparkfun would do well to provide better quality parts for this kit. The best PCB mounted DIN sockets I have found are 61NC5F. The almost identical shape of the port allows the Game Boy Advance, Game Boy Advance SP and Game Boy Player to accept all the second generation Game Link Cables, but only for backward compatibility between Game Boy and Game Boy Color games. The second generation Game Link cable cannot be used to link Game Boy Advance games, and the third generation Game Link Cable cannot be used to link Game Boy or Game Boy Color games. There are also newer, improved, dual versions of the MGB-010 cables with DMG and GBC/GMP connectors on both ends, which are even more versatile, see Example Cables below. 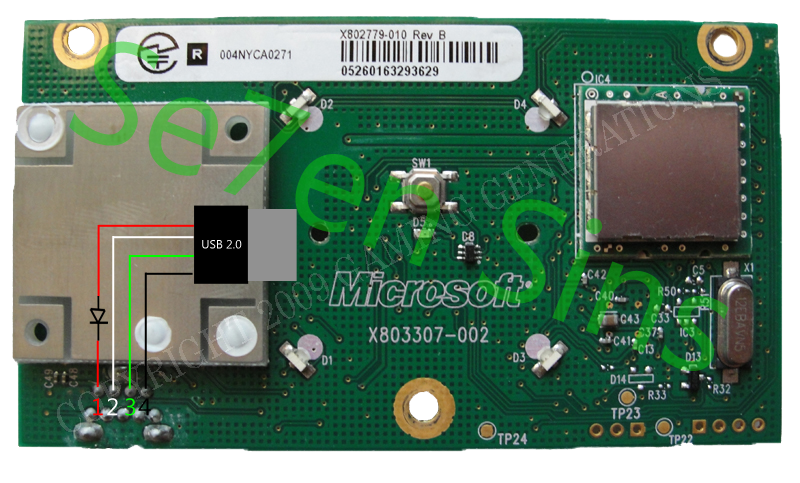 For the ArduinoBoy, as it has a Game-Link connector port, a standard cable can be used. The ShieldBoy does not have this connector and therefore a hacked cable is required, i.e. a standard cable with one end having the plug removed and wires exposed. It should be noted that if you are building an ArduinoBoy with a GameLink socket, then as the only sockets available seem to be for the GBC/GBP then you will need a MGB-008/CGB-003 or if you are intending to use it with a DMG then only a MGB-010 (Dual), or DMG-14 adapter will be of any use – a DMG-04 would not fit the GMC/GBP socket, unless you can find a MGB-004. The most versatile solution, is to buy a MGB-010 and cut off one of the DMG connectors and replace it with a 5 pin DuPont connector. That way you can use either a GBC or 5 pin header as the connector on the ArduinoBoy board, see Making your own ArduinoBoy. New DMG-04 cables are quite difficult to find, and a second hand one seems to go for £7+, so the third party MGB-010 equivalent above is actually quite reasonable. 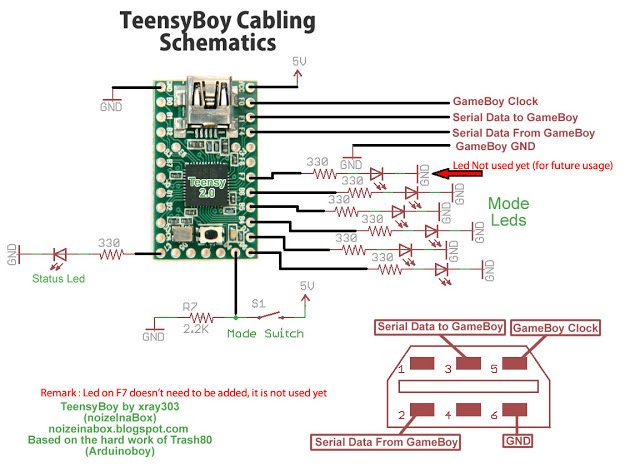 It should be noted that CatSkull’s ArduinoBoy and TeensyBoy use GameBoy Advance sockets (GBA), without the notch and with 6 pins, type “C”, see PCB Game Link Sockets below. It isn’t necessary to cut, and butcher, your GameLink cable if you get a Game Boy Link Cable Breakout Board. Three breakout boards cost only $2! Unfortunately, the pins (SO, SI, SD, SC) don’t line up with the ShieldBoy (CLK, IN, OUT), Teensy Boy shield (IN, OUT CLK), nor ArduinoBoy PCB#1 (BR, BL, TC, TR, TL => SC, NC, NC, GND, SO (alt: GND, SO, SI, CLK, 5V (this nearly matches – as SD isn’t connected, it might be possible to short SC and SD. However, GND and VDD are reversed!!!)) 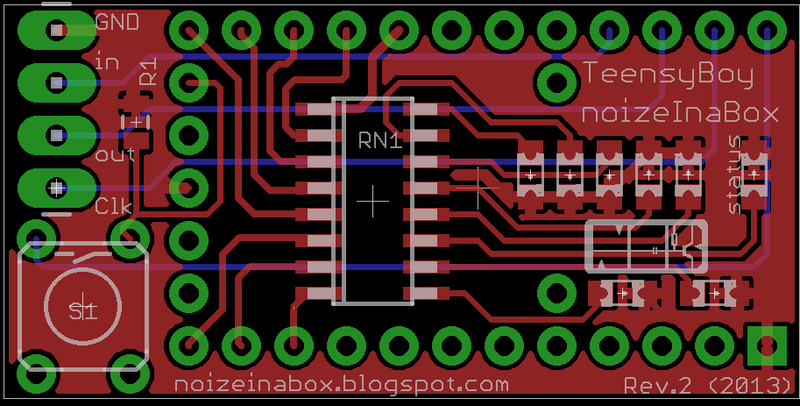 nor ArduinoBoy PCB#2 (whose connector makes no sense, when looking at the schematic). So, some hacking or re-routing will still be required. 4 pin with a notch in the plastic tongue. So don’t purchase the wrong type. The 3, or 6, pin is the GameLink connector, whereas the 4 pin (with the notch) is the charger port. The GBA GameLink socket will accept GBP/GBC plugs. The 3 pin socket (without a notch), are identical to the GBC sockets above except that the outer shell has a indent to allow GBA cables to be accepted. Type C (without the plastic notch, but with notch in the shell) is for the GameLink cable and is the type used by CatSkull in the ArduinoBoy and the TeensyBoy (Pro). There are a lot of GameBoys available from Japan, in Japanese. There may be restrictions on playing US games on them, but then again a lot of games will still work. This restriction should not apply to mGB or LSDj though. Yamaha PSR300 – MIDI keyboard comes in useful. That article you linked to has nothing to do with me or my teensyboys. later trash80 ported the code himself to the entire teensy platform. However, an ATmega 32U4 Teensy 2.0, as used in the prototype, is kind of pricey when compared to a bare ATmega328PU IC ($7 (Teensy 2.0 USB Keyboard Digital Development Board U Disk Experiment AVR Tool, £5.77) vs $2), and the more powerful Cortex40-M0+ based Teensy LC, which is used in the production models, goes for around $15-20..! These prices are taken from eBay and AliExpress. 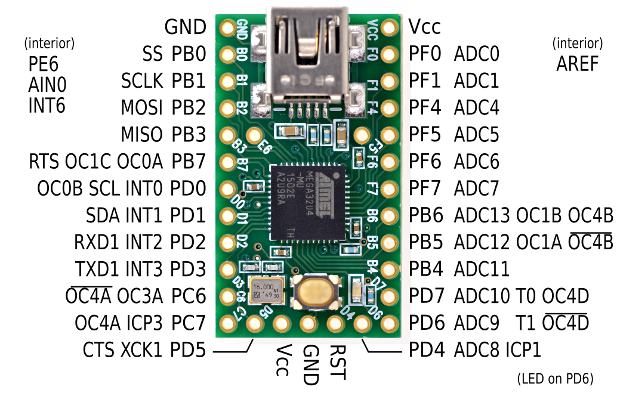 [Ed- On the Teensy Tech Specs pages the LC is actually cheaper than the 2.0 ($11 vs $16-24 respectively)] The Teensy is used as it is USB compatible, due to the ATmega32U4 at its heart. In this video I show how you can make an Arduino (Pro) Micro, Leonardo, or any Arduino with an ATmega32U4, became a true USB -MIDI class compliant device. Easy. No glitches. In this first video, of three, I show how to use the MIDIUSB library. See also #2 Arduino (Pro) micro as a USB-MIDI device – Real Life Example and #3 Arduino (Pro) micro as a USB MIDI device – Change the Name of your Arduino. Playlist: Arduino (Pro) micro as USB MIDI device (updated!). 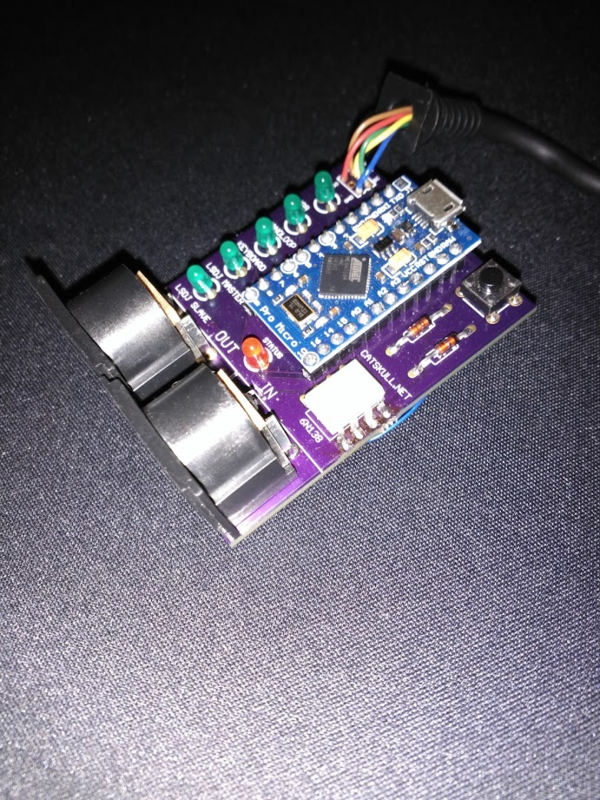 What is different from the ArduinoBoy is the lack of the MIDI connector. This is because it is a USB MIDI device. Therefore a DIN to USB conversion is required, see MIDI on OSX or (May 02 How to Adapt DIN 5 Connectors to USB and Basics of USB). 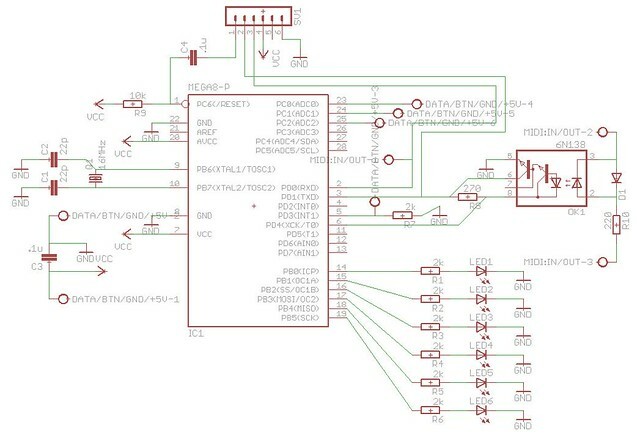 This requirement for a conversion could be a bit of a pain, and so the original ArduinoBoy with the DIN connectors might be preferable, in some cases. Note that the TeensyBoy Pro has both USB and DIN. To see how, and where to wire, the additional DIN sockets, see Using a Pro Micro below. The Teensy LC is also used on the TeensyBoy Pro. It should be noted that the LC and the 2.0 are not swappable, as the pin outs differ. 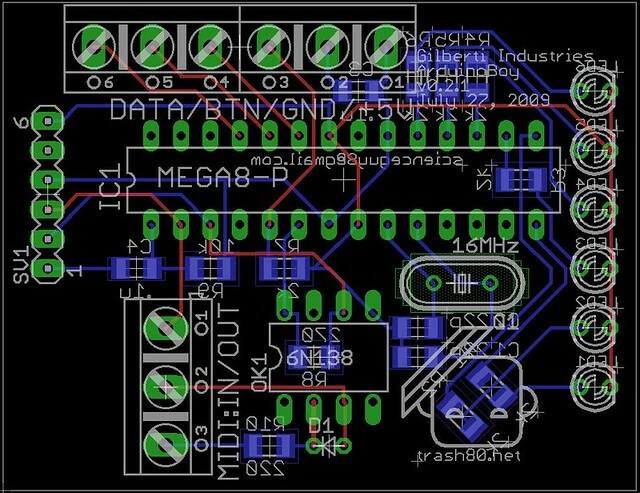 So, a TeensyBoy board designed for a Teensy 2.0 could not have the 2.0 swapped out for a LC – not with out a code change or re-wiring of the board. The same applies to the 3.2 and LC, although a number of the pins offer the same function, not all are the same. In the UK, the cheapest place seems to be Hobby Electronics, Teensy LC, £11.28 +£2.40, Pimori have them, Teensy LC, for £11.50+£3.25, the PiHut, Teensy LC, £13.50+£2.99, followed by SK Pang, Teensy-LC, £14.52 + £3.50. PJRC sell the LC at $11.60, but don’t accept PayPal. 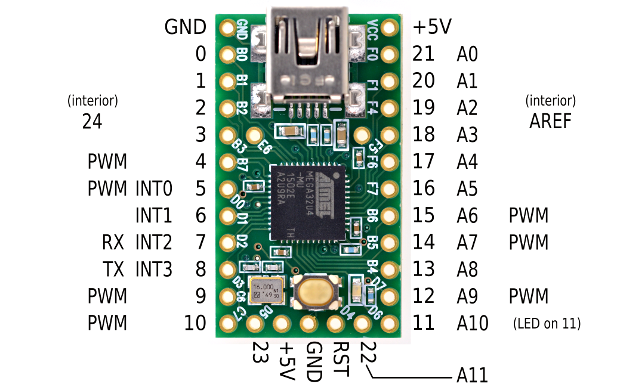 From HT, Teensy 2.0 is £16.20 and SK Pang does not stock it. PJRC sell the 2.0 at £16, but don’t accept PayPal. I can’t seem to find the schematic for this “Pro Micro Boy”. 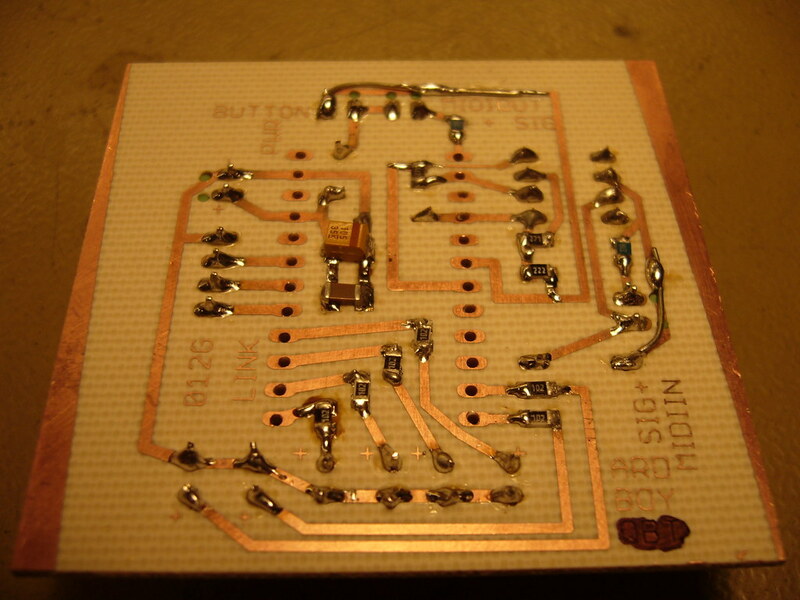 Also, note the two diodes. 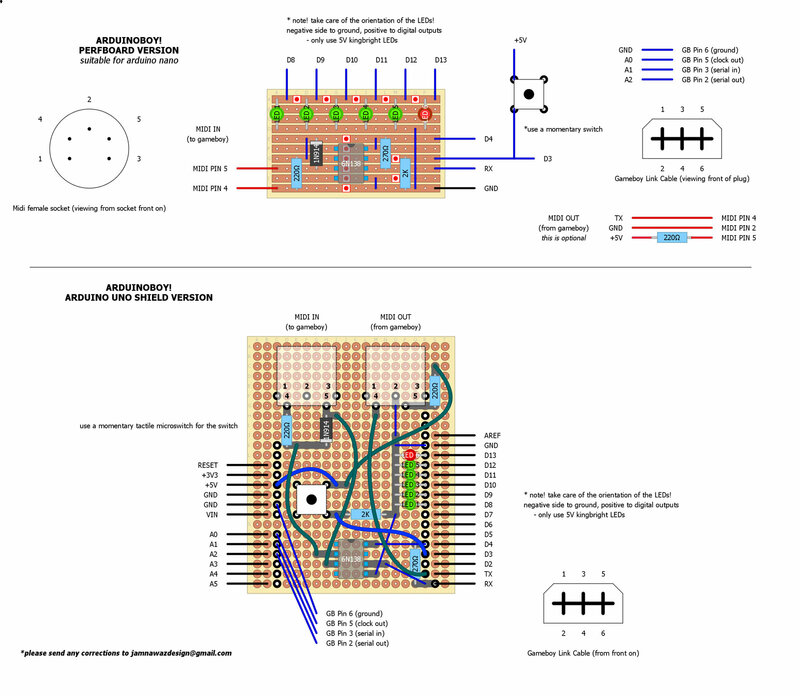 Compare that with the zeroerrequattro schematic below that uses one diode. It is not clear what the second diode is used for in the above CatSkull circuit. Note that the opto-coupler on only one of the DIN sockets, the input DIN. However, the Pro Micro may not have sufficient power, so exchanging that for a Teensy LC would seem to be expedient, and in that case, you would have effectively a TeensyBoy Pro. The Mini does not have a USB connector. 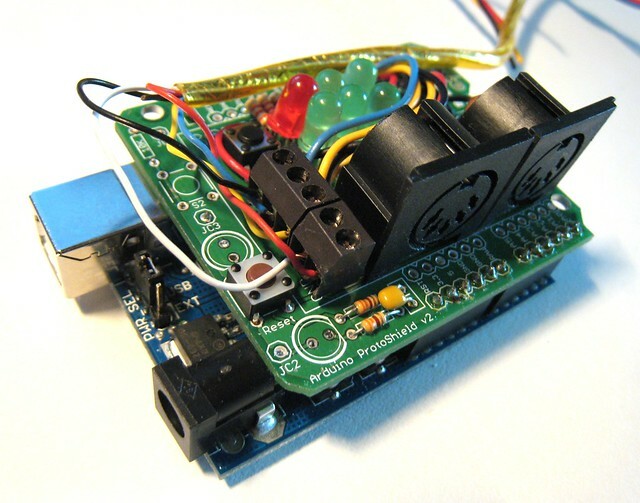 Another variant of the ArduinoBoy that is worth a mention and in-depth look is the ShieldBoy. 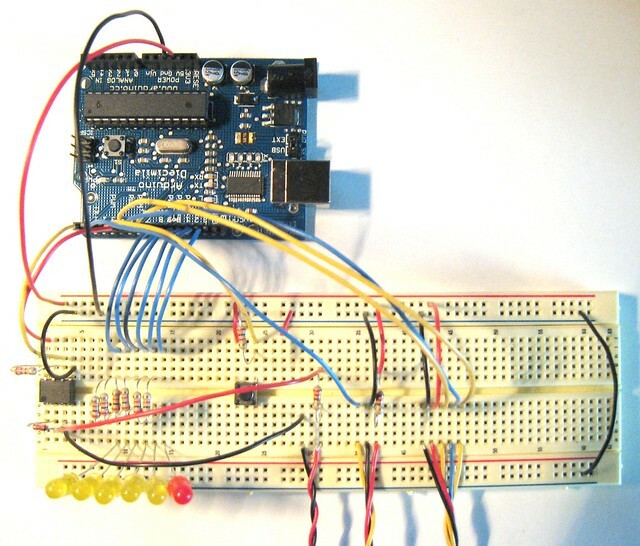 Pin 1 from the 74ls14 or equivalent chip goes to the TX pin of your arduino. Ground and 5v of 74ls14 go to 5v and ground on arduino. Same with the ground and 5v on each midi thru/out. I have only ever used this for midi thru, never tried it with midi out on the latest lsdj.